Hurricane Vance in the eastern Pacific Ocean, seen from the International Space Station. A camera on the International Space Station has captured a spectacular view of Hurricane Vance as it prowled across the Pacific Ocean. The amazing video of Hurricane Vance from space was captured on Sunday (Nov. 2) as Vance — its gaping eye clearly visible — was moving about 500 miles (804 kilometers) west of Manzanillo, Mexico. 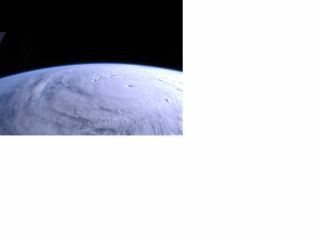 NASA's High Definition Earth Viewing (HDEV) experiment on the space station, which provides live HD video views of Earth from orbit, recorded the hurricane views for NASA. The experiment was installed on the space station earlier this year in April after arriving on a SpaceX Dragon cargo ship. Hurricane Vance was upgraded from a tropical storm to a Category 1 storm on Sunday. The National Oceanic and Atmospheric Association reports that the storm is weakening as it moves toward land. If Vance makes landfall at full strength, it could bring chaos to some of Mexico's beach towns. But from 220 miles (354 km) above the Earth, the storm looks tranquil and static. The HDEV experiment has four cameras pointed at Earth (one pointing ahead of the station, two back, and one almost straight down). It is mounted on the External Payload Facility of the European Space Agency's Columbus module. Scientists working on the experiment want to understand the effects of powerful particles from space, called cosmic rays, on HD video quality and equipment. In addition, the camera needs to be housed in a protective casing to keep its temperature steady, and scientists will look at the effectiveness of their current design. The work will inform decisions about cameras on future space missions.